Hello everyone and welcome back to “Questions & Answers” here at Raging Biblioholism. We’re here celebrating 10,000 views on the blog and so, after some brainstorming, we decided to give you a double whammy. That’s right, this isn’t just a “Questions & Answers” interview but also the second in our recurring column, The Art of the Cover. 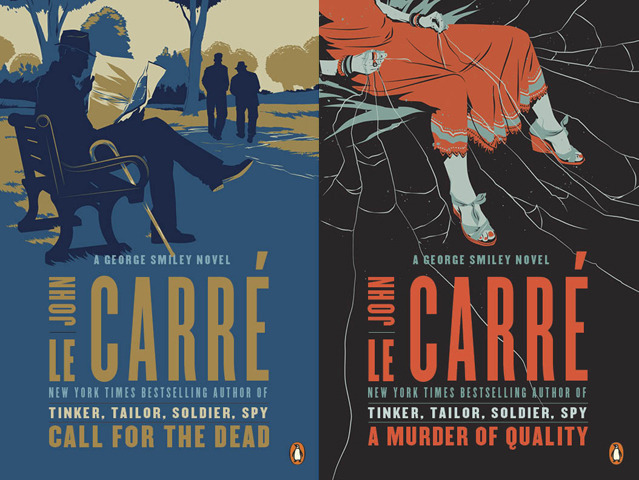 Our guest today is Matt Taylor, the designer of the fantastic rejacketing campaign by Penguin for John le Carré’s novels. We’ll bring him out in just a moment but first let’s talk Covers. I didn’t start reading le Carré until very recently. I read Our Kind of Traitor in early winter about two years ago but held off on procuring any of the other novels because, well, I was bored by the design. I thought “hell, I can read any spy novel – and plenty of them look better” and that was the way the cookie crumbled. It’s not to say the designs were bad – but they just didn’t excite me in the least. Then, walking through Barnes & Noble last fall, I spotted this stunningly beautiful redesign for Tinker Tailor Soldier Spy. I was transfixed. The pop of the color, the sense of danger about it – but also that nod to a cartoon sensibility. No, not cartoon – childhood. It’s a sense of the way spies and the Cold War and all that have a Saturday mornings in October feel to them. Maybe that’s just me, but these covers made me think of the excitement of those crisp mornings when all I had to do was sit in the yard and read a really great novel. I was thrilled and had the great pleasure of powering through the entire Karla Trilogy back to back to back. I even got the Tinker Tailor cover as a print to hang in my new apartment – and I can’t help but smile every time I see it. I, for one, can’t wait to read them in September (late August publication date and all). Anyway, on that note, a big round of applause please as we welcome Matt Taylor to the stage. DB: So, for starters, I’d love to talk about the ideas behind these covers. 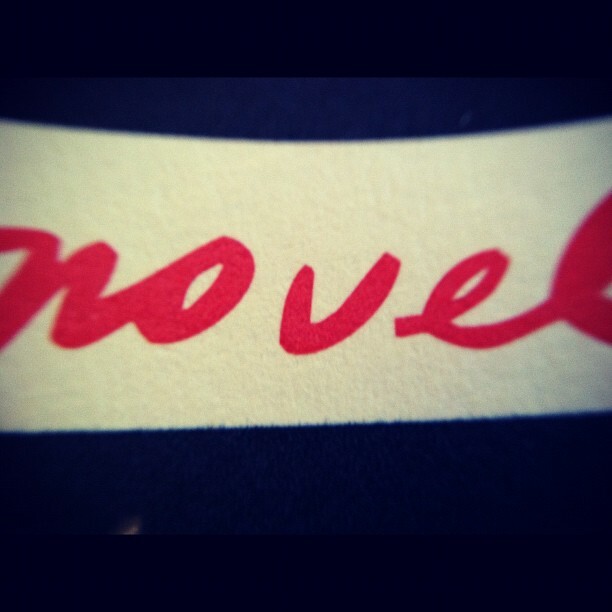 The designs are all so vivid and perfectly matched to the novels, so what’s your inspiration on each book cover? Some appear to be scenes specifically from a book but some are also a bit more oblique, so I’m curious as to how you locked in on a specific idea (or threw out an idea for a different one). MT: Each cover started with me reading the book. I’d sketch ideas that tried to capture the mood of the story rather than a specific moment (unless that moment summed up the themes of the novel particularly well). In fact, even the books that feature a specific ‘scene’ in most cases aren’t scenes that are on the page or are composites of a number of moments using one as a jumping off point for the other. DB: Were you a le Carré fan from before this project? MT: Honestly, no – I had never picked up any of his books before, although some of the classics (Tinker Tailor Soldier Spy and The Spy Who Came in from the Cold) were on my ‘to-read-eventually’ list. Because of the speed I usually have to read them at, I haven’t been able to take the time to digest them as much as I would like (reading four books consecutively and at speed by any author can be pretty tiring), but The Spy Who Came in from the Cold and A Perfect Spy I will definitely go back and reread at a later date. DB: I actually felt rather the same way – those two books were on the same ‘t0-read-eventually’ list for me, until these covers came around. So on to creation: what’s the process like, with creating and then refining an idea, then bringing it to Penguin, and so on? MT: Once I’d read the book, I would sketch 2-3 ideas and send them to my art director who would then forward them on to Mr. le Carré. He would choose his favourite and then it would come back, occasionally with a note or two, but usually not. The sketches would usually be in colour, but this sometimes changed in my head between sketch and final. In most cases, I would create the final artwork from the sketch and send it across to Penguin in a finished state – providing colour options if I had deviated from the palette of the sketch. Itwas a remarkably straightforward process with minimal changes which is a testament to the faith that the art directors had with my work and for me finding the tone of voice for the series and maintaining that throughout. DB: I saw on your tumblr (here!) that you mentioned doing everything digitally –what spurred you to go digital instead of pen & paper? MT: To be honest, a lot of it comes down to speed. In an ideal world, I would draw all my work and produce all the line details by hand in pencil and ink, but the process of sketching, drawing, scanning, printing, redrawing, rescanning, reprinting, redrawing, etc, is very time consuming. If I draw directly into photoshop then I can sketch on layers in the same file, comparing versions and cutting and pasting from different drawings to get a composition that I am completely happy with. DB: Creatively, what’s it like balancing “day job” and “art job” – especially one as successful and high-profile as yours has become? MT: Well I am lucky enough to have a day job working for the multidisciplinary design agency ilovedust, so the main difference between the day job and night job is the level of clients (much bigger on the whole in the day job). I was lucky to maintain a reasonable level of success for the three years before I joined ilovedust, but having a day job offers a much greater level of security and it means that I can really pick and choose which freelance jobs I take on. I think I have the best of both worlds, given that I am still always drawing and have both the quick turnover of varied and interesting work at the studio and the freedom to take on only the most interesting projects that I am pitched with freelance. DB: What are some of the projects you’ve done that you’re most proud of? MT: I think the Penguin covers come quite high up the list, but I’m proud of almost everything that I have done – I’m just as proud of a small editorial as I am a full blown ad campaign because it tends to be elements of an image that please me more than their intended use. I’m sure no one else is especially bothered by the way I managed to, for example, catch the shadow on a figure’s face, but it’s getting those little details right that makes me happy. DB: How do you feel about book covers, in general? I’m not sure if its necessarily something anyone else gives thought to, but I for one am constantly intrigued by the decision to choose cover X or rejacket a series like Y, and I’m curious if it’s something you pay attention to now that you’re in the field. MT: Whoever said you can’t judge a book by its cover I would say is about 50% wrong. Given my field of work and the fact that I am an illustration and design junkie, I have always had an interest in book jacket design – before this assignment, it was something that I had wanted to find a way into. A good book cover is usually a sign of a decent book – it indicates to me that there is an interest in how there’s book is presented or who it is meant to appeal in a way that your big standard genre fiction or chick-lit for example doesn’t seem to have. I can tell if a book is going to be up my street by looking at the cover nine times out of ten – there’s nothing more frustrating than a good book hidden by a bad cover. I also think that in this age of kindles and iPads, a lovingly crafted book jacket helps make a book a desirable object that you want to hold onto and put on your shelf. DB: Do you have any exciting projects on the horizon (book covers or otherwise)? MT: Sadly not many that I can talk about – most of the work I do at the moment is for so far into the future that often by the time it arrives I have forgotten that I did it to start with! I do have a few more le Carré covers on the way and I’m contributing to a bunch of shows at Gallery 1988 in Los Angeles which isalways a blast. DB: Alright, well we won’t pressure you for your secrets. Thanks for taking some time to chat with us – I for one can’t wait for the upcoming le Carré covers and I’m now keeping an eye out for the rest of your work as well. Hope to see big things from you in the future! A round of applause for Mr. Matt Taylor, artist and designer! You can find him online at www.matttaylor.co.uk or on the cover of masterful spy novels in your local bookshop. That concludes this special The Art of the Cover edition of “Questions & Answers”. Thanks for continuing to read this little old blog – it’s my pleasure to write for you. Read dangerously, my friends, and we’ll see you again soon.